BAY POST INTERNET: Are diamonds really forever? Right now, the “recommended” amount you should spend on an engagement ring is two months’ salary. It is that time of the year when relationships bloom, heart's flutter and bride to be eyes light up with vision's things, that sparkle. In the print media, electronic media, the Internet and just about everywhere else you look, there are ads promising the best deal on that much needed and desired engagement ring. Before you plunk down a significant portion of your annual salary for an engagement ring here are a few things to check out. First take a look at the number of engagement rings for sale on line. I am not suggesting you buy one on line, although what she does not know probably won’t hurt her, but the real question is. Where did all those rings come from? The answer is they were bought by idiots who got caught up in the "Diamonds are forever" marketing ploy, and things did not go well. They are now for sale and usually NOT by the original buyer. As one who has had a number of engagement and wedding rings end up in a pawn shop case, the return on your investment is really poor. Example: a lovely blonde who pawned her(our) engagement rings (worth several thousand dollars) to make a $200 car payment. I know she was upset the wedding was off, but if she had called I would have probably made the car payment for her. The whole engagement ring thing started in the late 1930’s as a marketing effort to kick start diamond sales. 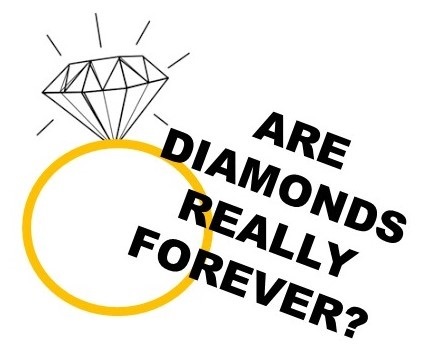 Since nothing says "I love you like a diamond" and "diamonds are forever" resonate, guys have been on the hook for ever larger upfront investments in their matrimonial future. That is kind of interesting given that fact that according to the American Psychological Association 50% of marriages end up in divorce, and subsequent marriages are more likely to fail even if the engagement ring is bigger. So, if she is sending you all those signals about getting married and suggesting an engagement (read that I want a ring) set down and have a long serious talk. If you make $60,000 dollars per year that’s $5,000/per month or about $10,000 for a ring. If you make $100,000 per year that is about $8333/month or about $16,700 for the ring. These days you can finance that amount for up to eight years, and that number is interesting because the average marriage in the United states lasts about 8.2 years. Think about your student loan. If that upsets you, think about how you will feel five or six years into a marriage that is slipping away, and you still have few years to go pay off what got you into all of this. So, remember all this engagement and to some degree wedding ring stuff is a marketing creation of people who dig crap up out of the ground, polish it up, claim it is their own, establish outlandish prices in a closed market and take advantage of your situation. The bottom line on all of this engagement ring hoopla, is it gives your beloved a symbol to wave about in the faces of her less fortunate friends who are still looking forward to reeling in a “ring” of their own. If a ring costing 20% or more of your annual salary is a required pre-commitment of endearing love do a little research, have a serious conversation with your partner and remember this: diamonds are not forever: they're just expensive. These tips are really a blessing tbh. I never knew we had to consider so much before purchasing rings. I normally just go to the jeweller and by the ring that looks the most prominent. Thank you for your tips.